Just applied online for Medicare. Took 5 minutes. Single payer anyone? This is no radical, this is the former president of the Center for American Progress and Bill Clinton's former chief of staff. But we knew this all along. We know what works, and we know what would have been an easier path to improving our healthcare system. Some people pushed for an ACA style reform because they are owned by the insurance industry and liked it for that reason, and some people were sold on the idea that it would be easier to pass because it was a compromise with the insurance industry. We'll never know what could have passed, but I'll go to my grave thinking a simpler idea like a medicare buy in could have worked. When you're dealing with something on this large of a scale, the ability to minimize the complexities and places where things can go wrong matters. In retrospect, it was an aspect of the ACA's stupidity that I didn't emphasize enough. Anyway, I remain convinced that a medicare buy in is the policy principle we should have organized around 5 years ago, and the one we should be organizing around today. Obamacare is going to be a disaster (actually seems like it could be even worse than I had imagined which is saying something), and this will work without having to completely undo the rube goldberg structure that the ACA needs to exist. Let's do this. Dream big for ideas that actually work. 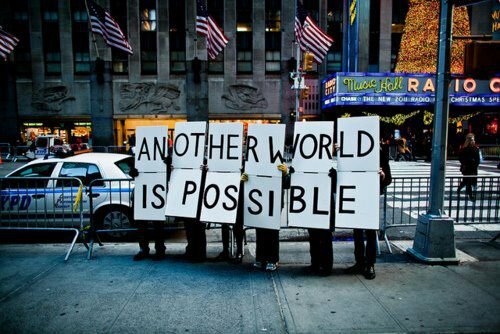 Another world is possible. You wrote this, as I'm writing a paper on Obamacare and whether it is cost effective...pretty sure I won't get credit for one line reading: Nope, nope, nope; single payer! with a Hyperbole and a Half drawing.